After the hardships Peter faced over the past ten pages, it feels really good to see him smiling again. Also, to those who have seen Pixar's Inside Out, this moment could be considered a new Core Memory for Peter, and the one that spawns the creation of "Piano Island" in his personality. When I was in sixth grade (after only being able to play on a tiny keyboard for years) my parents finally could afford to invest in a piano. Our first was an off-brand upright, and it was what I practiced on for the first six years of my lessons. Around the time when I graduated high school, they invested in an upgrade: a Boston Baby Grand, which was one of the most gorgeous instruments I've ever played. Yes: was. 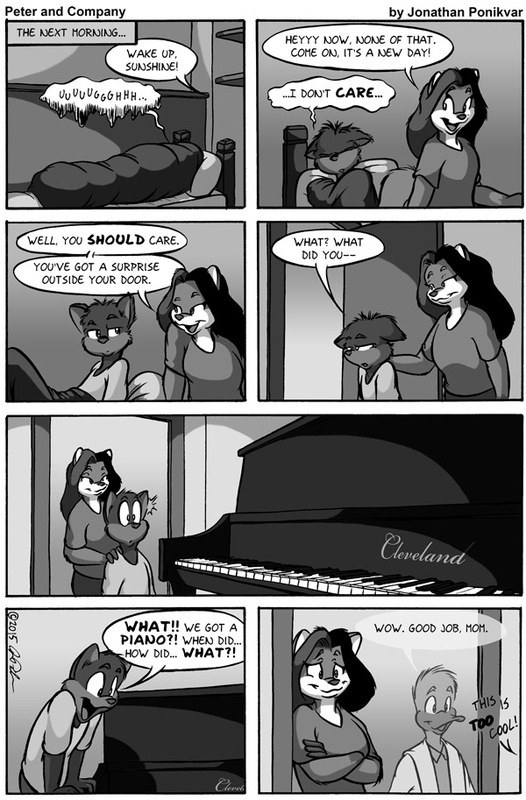 The story of what happened to that piano will be revealed in time (since it will happen in the sequel series, Peter & Whitney, coming soon to the Katbox). In the meantime, I couldn't give Peter a Boston piano here, so instead he has a Cleveland.